Service 1st representatives accept the Community Progress Award presented by the Columbia-Montour Chamber of Commerce and the award sponsor, Rob Beer, CEO of the Berwick Hospital Center. Back Row (from left): Rob Beer, CEO of Berwick Hospital Center; Karen Wood, Service 1st vice president community relations; Tom Rambo, Service 1st branch manager; Linda Brown, Service 1st executive vice president; Harold Hurst, Service 1st board member. Diamond Credit Union, Pottstown, Pa., was voted the People’s Choice in credit unions for the third consecutive year. The 15th annual Berks County People’s Choice Who’s Who in Business survey is a survey conducted by an independent market research firm. The survey is presented by the publishers of Berks County Living Magazine and identifies the region’s leaders in multiple business categories as determined by the residents of each market. 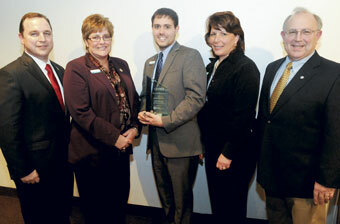 Diamond Credit Union has been named the People’s Choice in Berks County in 2007, 2008, 2010, 2011, and now 2012.